The flat, featureless saltbush plains stretch into the haze on the horizon. We are driving the Cobb Highway, the Long Paddock. Since the 1840s drovers have been driving cattle along this track, from stations in Queensland to the markets in Victoria. The vegetation offers little relief to the traveller’s eye. The drought tolerant, mineral rich saltbush puts on no airs and graces. It’s not an ostentatious plant. It hides its value beneath its dull grey-green scrubby appearance. Plain but highly nutritious, sheep grow fat and healthy on it. It dominates these plains. 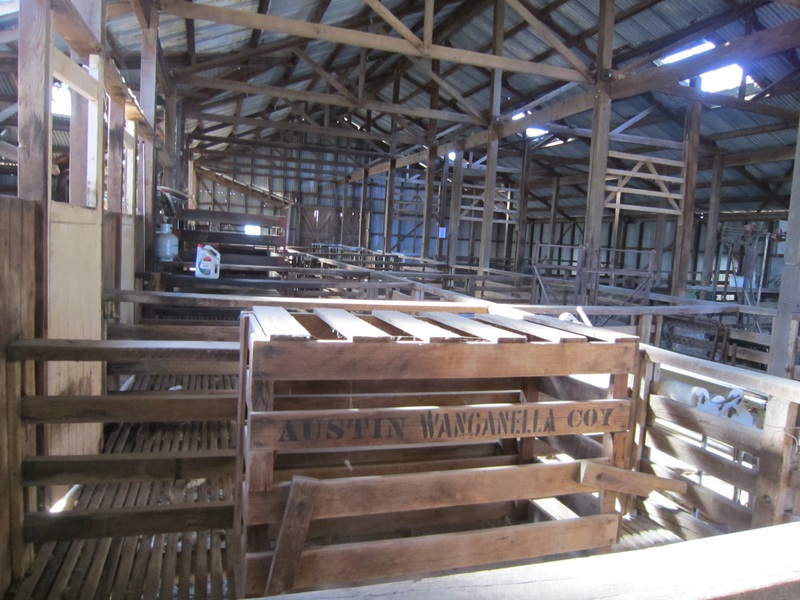 At Hay we stop to visit the historic timber woolshed, moved stick by stick from Darling Downs to become a tourist attraction and home to the shearers’ hall of fame. The wool industry has had mixed fortunes in Australia of late. Animal rights activists condemn the practice of mulesing as barbaric and cruel. The wool industry claims it is essential, extending the life of sheep many years by preventing them from becoming flyblown. The debate is heated and insults are thrown both ways. Billy, the demonstration shearer at Hay, is defensive. He is part of the marketing arm of a major industry and defender of a romantic bush ideal. Highly skilled, he shears a lamb in minutes. His strong arms are in control, the young animal relaxes and calmly accepts his actions. The worn timbers of the woolshed, the scent of lanolin and the raw earthy animal smell of the sheep, evoke another world. I fear for sheep that may in the future be shorn by robots in a factory to six sigma efficiency. I hope Billy and others like him continue their craft. Rough and basic this life might be, but these men work closely with the sheep and lambs, they know them, understand their ways. Let’s hold that relationship dear, for all its faults. Let’s cherish the good in that and build on it. As Hay disappears in the rear view mirror, emus scatter alongside the road, their tail feathers bouncing like ladies bustles behind them. Driving north, the sun is high and reflects on the bonnet of the car, raising the temperature. Soon we long for cuppas and ice cream, and make a stop at the small town of Ivanhoe. While Richard checks out the list of road closures and the Connoisseur ice cream, I admire the art works displayed in the shop windows along the Main Street. 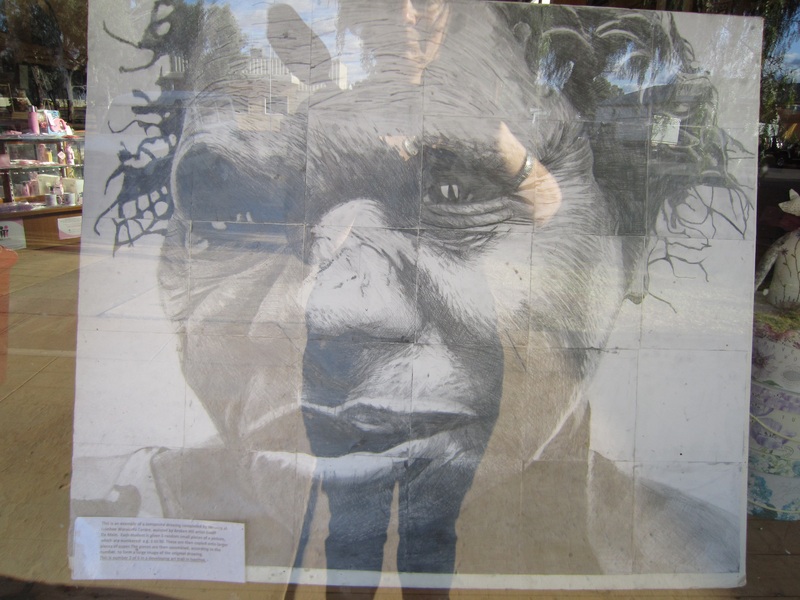 An initiative at the local correctional centre has created remarkable line drawings of bush characters. Each drawing was created on grid fashion with each artist assigned a square of the grid. A clever teaching method that produced great results. The saltbush plains are behind us now, the roads are iron red sand, unpassable in the wet. A frosting of green pick contrasts with the red dirt to create vivid colour combinations. The country is alive with emus, goats, sheep and kangaroos, all feeding from the minerals held in the rich red soil. The pale wintry colours of Victoria are forgotten as we speed onwards. As the afternoon draws on we begin to look for our first bush camp of the trip. Howard does it again. “We’re stopping here”, crackles the radio as the utes turn off to the right. 500 m off the road, we pull into a beautiful treed clearing, partly protected from the wind by mounding sand. There’s plenty of wood for the campfire and soon we are cooking dinner together, enjoying the warmth of the fire and the conversation. As I retire to bed, I hear a male voice raised in song, a beautiful Italian operatic aria rings out across the sands, combining with the faint song of nature as the wind whistles and moans in the casuarinas. This entry was posted in On the road, Outback and tagged Australia, Outback, Travel on 23/05/2015 by Deb McSephney. I am going to be alright reading your beautiful words. I am so relieved!